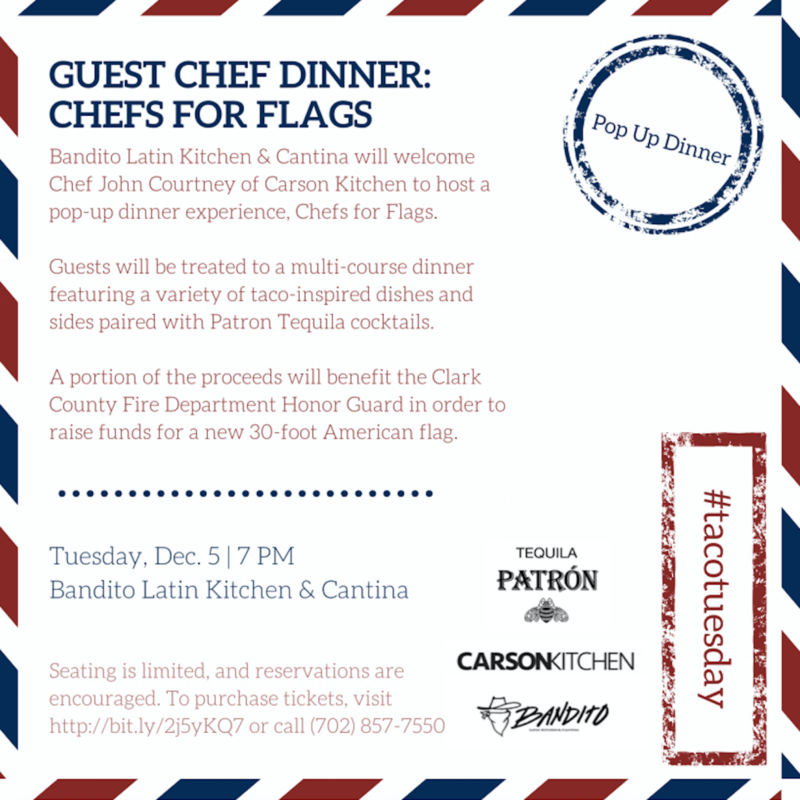 Bandito Latin Kitchen & Cantina will welcome Chef John Courtney of Carson Kitchen to host a pop-up dinner experience, ‘Chefs for Flags,’ on Tuesday, Dec. 5th. A portion of the proceeds will benefit the Clark County Fire Department Honor Guard in order to raise funds for a new 30-foot American flag. This special dinner will be priced at $50 per person (excludes tax and gratuity), where $40 of every ticket will directly benefit the Clark County Fire Department. The menu will feature a variety of courses created by Chef John Courtney and Bandito’s Chef, Jordan Perry, paired with some of the restaurant’s signature Patron-based cocktails to create a truly unique twist on #tacotuesday. One seating only begins at 7pm. Purchase your ticket HERE. Bandito Latin Kitchen & Cantina focuses on the foods of Latin America with an emphasis on Mexico, providing a truly unique culinary adventure. Owner/Operator, Kent Harman’s, philosophy of fresh food and creative cocktails is evident throughout the entire menu from signature dishes including Fried Octopus and Habanero Shrimp to the cocktails like the Smoking Bandito and El Guapo Margarita. The restaurant was designed by Harman and its décor is a mix of rustic and modern, with plenty of finished metal, hand-distressed wood and vibrant colors, all bathed in natural light that fills the restaurant through its 30-foot tall glass windows. Bandito is open daily from 11am to 10pm, with dinner service extended until 11pm on Friday and Saturday nights. Learn more of the story and become part of the Bandito Posse by registering for its customer loyalty program www.BanditoLV.com. Follow along on Facebook, Twitter and Instagram. Select press materials including menus can be found HERE.